Although the packing continues, it’s slower and demands attention to detail. I’ve uncovered papers of all sorts that document my existence on planet Earth since 1982, the year of my college graduation. In the quiet stillness of late afternoons that turn to evening dusk, the pathways of memories seem endless. From that day in May, almost thirty-one years ago, I’ve found evidence of noted accomplishments and jottings from others who were instrumental to my having lived a life of joy and curiosity. In my discoveries of myself, a pattern emerges: I visualize a goal, I research and create challenges for myself and then I reach my goal. Then the cycle starts all over again. One of my current curiosities is trying to get a basic understanding of the enormity of the history of Constantinople, or Istanbul, my soon-to-be home. This city, established by Greek colonists around 657 BC, became the capital city of the Byzantine, Roman and Ottoman Empires. Even if I start in the “modern” times of AD 330, when Constantine the Great made it the new capital of the Roman Empire, it is almost too much for my brain to absorb, but you gotta start somewhere, right? The religious history of Istanbul is wide and long and high and deep. It will be fascinating to live there and share the streets with these western-influenced people inside the diptych of where Islam and Christian beliefs meet. In no way do I claim to be a historian or expert in church history but from my reading it seems that Roman Emperor, Constantine, along with colleague and co-Emperor, Licinius, issued the Edict of Milan in AD 313, which proclaimed tolerance of all religions throughout the Empire. Constantine likely witnessed forms of Christian persecution in Rome, but eventually he became the first Roman emperor to convert to Christianity. After restoring the unity of the Empire, through both governmental reforms and consolidation of the Christian church, he chose Constantinople to be the new capital. In AD 325, Constantine summoned the Council of Nicaea, a council of Christian bishops brought together to attain consensus in the church on several hot topics. One of the main accomplishments was settling the Christological issue of the nature of The Son (Jesus) and his relationship to God the Father, which resulted in the Nicene Creed. The intent of this was to unify the beliefs for all of Christendom. Another result of this council was an agreement on when to celebrate Easter. In her delightful blog about all-things-Paris, Theodora Brack, wrote a recent article, Paris Tête-à-Tête: Arts Update Teaser, that showcases new exhibitions in La Cille-Lumiére, the City of Light. Currently at the Centre Pompidou is an exhibition I wish I could attend which highlights one of my fav’s, Salvador Dali. 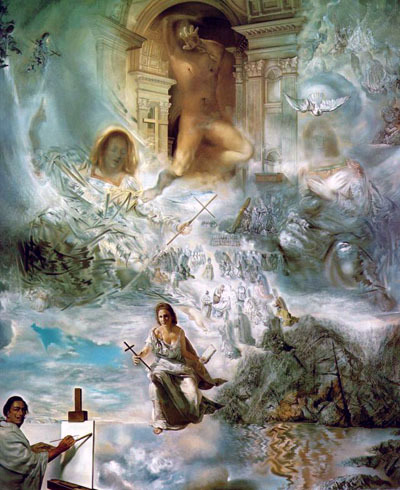 After reading her article and doing this ecumenical council research, I found that Dali was inspired to produce an enormous painting called The Ecumenical Council, in 1960, after the 1958 election of Pope John XXIII. According to Wikipedia, this painting expresses Dali’s renewed hope in religious leadership following the devastation of World War II, as the Pope had extended communication to Geoffrey Fisher, the Archbishop of Canterbury. Communication between the Roman Catholic Pope and the principal leader of the Church of England had not happened in more than four centuries. This history of the sieges and battles, emperors and sultans seem to go on and on and on. Istanbul’s history is a long one and I’ve just started. Eventually, in 1453, the city and the Empire fall to the Ottomans. Although that’s nobody’s business but the Turks, I hope to start uncovering that piece of history, as well, as I work my way to Istanbul. A few weeks ago, when I announced my employment with an international school in Istanbul, a sweet friend of mine posted this video as a gift of congratulations to me. We met on top of a mountain in Austria, and that’s the real gift. Enjoy. Portion used: It represents the complete work. Low resolution: It is a low resolution image. Replaceable: It is not replaceable with an uncopyrighted or freely copyrighted image of comparable educational value.